So, Mumbai Indians still stay afloat in this edition of the Indian Premier League with a convincing win over the Kings XI Punjab. Electing to bat first at the Punjab Cricket Association Stadium, Mohali, Mumbai meant business. 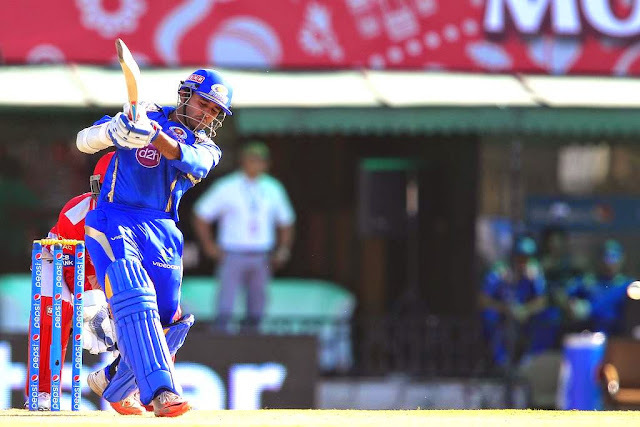 In the “Do or Die” game Mumbai were eying a play-off spot. Both Simmons and Parthiv looked in good nick. Mumbai’s first step to success was a good opening partnership which was provided by the two openers in Lendl Simmons and Parthiv Patel. Both of them put on a solid stand to boost the team confidence first up. Continuing his good form in the tournament, Simmons quickly got to his fourth fifty of the season. He was scoring effortlessly and on will. While on the other end, Parthiv patel finally converted one of his good starts into a fifty. He was relieved after reaching his fifty after some good cameo’s in the previous games. However, Parthiv threw his wicket soon after getting to his fifty to the upcoming young leg-spinner, Karanveer Singh. But by the time, the scoreboard read 111/1 after 12.2 overs. Rohit Sharma, the newly engaged Mumbai Indians skipper, came in at No.3 with a view to accelerate on the good start. He played a handy knock of 26 off 20 balls before Mitchell Johnson, the Aussie speedster sent him back to the hut. 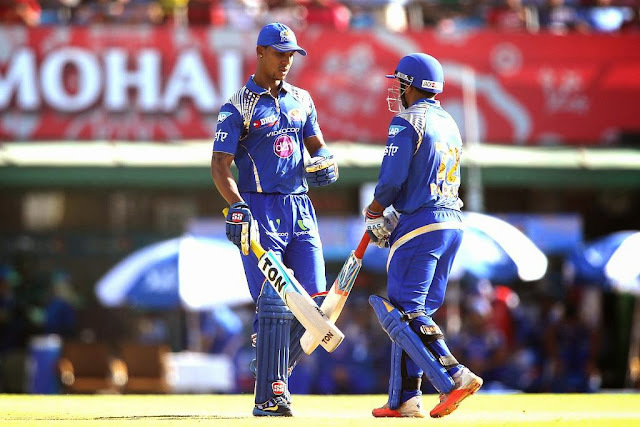 But for Mumbai, it was never a concern as Simmons was freely scoring and making life tough for the bowlers.Lendl Simmons was the last man to depart as he was caught on 71(54). Anureet Singh, the Indian medium pacer got his wicket. Mumbai eventually reached 172/3 after 20 overs. Punjab didn’t get a good start as out-of-form Indian opener Virendar Sehwag fell in the second over to Lasith Malinga with just 9 runs on the board. Glenn Maxwell, the explosive batsman was promoted to no.3 by his team-mate George Bailey. 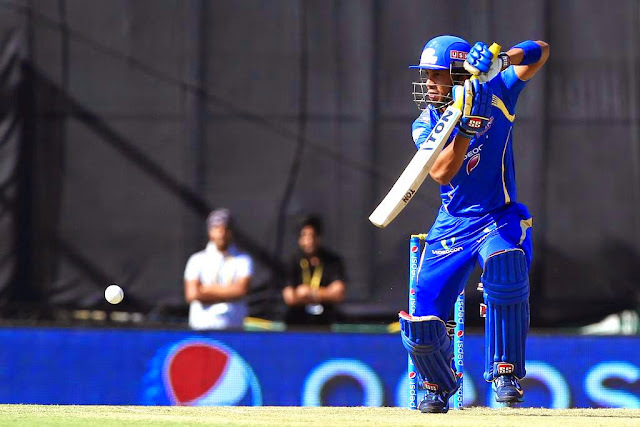 He was sent to score at a good rate and lay a platform for the middle-order to capitalize on. He left the mission incomplete as young gun Jagdeesha Suchith got him very early into his innings. 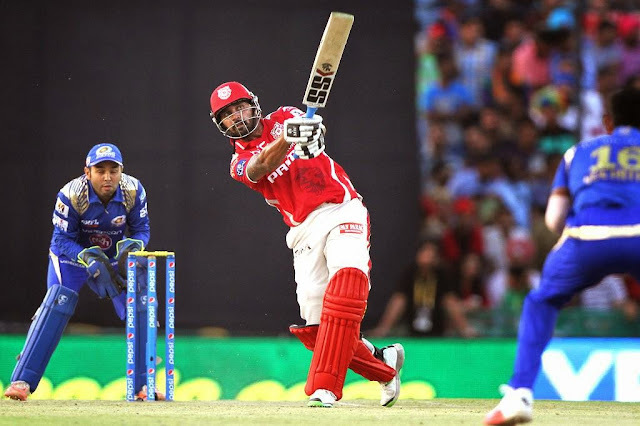 Murali Vijay was scoring decently at the other end but not at the rate KXIP would like him to. He eventually got out on 39 off 34 balls. After the wicket of Vijay, things never worked out for Punjab as three run-outs in the middle meant the game was done and dusted for them. Except for Miller 43(37) nobody stood up to the challenge. The middle and lower-middle order consisting of Bailey, Saha and Axar Patel failed to impress. Punjab were only able to score 149/7 after 20 overs. Man of the Match: Lendl Simmons was the Man of the Match for his blistering and match-winning knock. Kings XI's IPL woes go on following a loss to the Mumbai Indians.